The Illinois Governor’s Conference on Tourism took place Feb. 26 to 28 in Chicago. It is the premiere event for Illinois tourism professionals. DeKalb County Convention and Visitors Bureau Board Chairman Brad Hoey, Whiskey Acres partner Nick Nagele and I were in attendance with more than 500 tourism professionals. The night before the conference began, Cory Jobe, director of the Illinois Office of Tourism, hosted a reception for all of the Illinois makers. Jobe honored them for their contributions to the industry and presented each with an “Illinois Made” award that was handcrafted in Alton. Nagele, along with Kevin McArtor and Jenna Spychal of Jonamac Orchard, attended the reception. All agreed that it was a wonderful networking opportunity for the makers. As the certified bureau for DeKalb County, it is our honor to be able to nominate attractions from our area to be considered for this prestigious designation. DeKalb County currently has two Illinois Made attractions. Whiskey Acres received this honor from Jobe as the first DeKalb County Illinois Maker. Last May, we hosted an event at the Egyptian Theatre during National Tourism week, where Jobe awarded this honor to Jonamac Orchard. Events like these showcase the importance of the hard work that our tourism partners put in to make DeKalb County and Illinois an amazing visitor destination. Their efforts generate economic impact for the region and state that keeps businesses thriving, provides jobs and enhances the quality of life we enjoy in DeKalb County. One thing I have seen firsthand from working with our local attractions is that they are generous with their knowledge – collaborative and innovative. One of the best quotes I heard at the conference is a mantra that is a pathway to success: “Collaboration vs. Competition.” We embrace that motto. Another great outcome from the Governor’s Conference this year was the networking that provided Nagele, Hoey and me the opportunity to be in the WGN studio for the live radio show “Pretty Late with Patti Vasquez.” Nagele and Susan Daneberger of the downstate Daneberger Family Winery were guests on the air live with Vasquez from 11 p.m. to 2 a.m. The publicity that opportunity provided was priceless. Nagele talked to Vasquez about all our Bold Spirits attractions in DeKalb County, as well as Whiskey Acres. The show on the 50,000-watt powerhouse station can be heard in more than 30 states at night and already has booked another interview with Nagele. We made an invaluable contact for future publicity for DeKalb County tourism. The entire segment can be heard on our website at www.dekalbcountycvb.com. Jobe wrapped up the conference with his annual State of the State’s Tourism Address. He was proud to share that the economic impact of tourism for Illinois was more than $35 billion. For every $1 invested in tourism marketing, $9 was returned. Everyone was provided with a copy of the 2017 Travel Illinois Year in Review. When I looked through it, I was pleased to see some familiar faces smiling back at me. 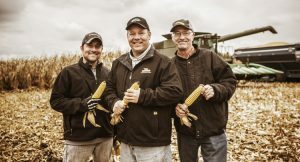 Whiskey Acres father and son Jim and Jamie Walter and Nick Nagele were featured, representing Illinois Made and DeKalb County. This publication is a premiere marketing tool that will be distributed by the Illinois Office of Tourism at many upcoming conferences and meetings throughout 2018. I invite you to take a look at the video Jobe shared on the economic impact tourism has in Illinois: dekalbcountycvb.com/economic-impact-of-tourism. Lastly, our bureau served on the committee to submit a new bid to host the Illinois Elementary School Association state wrestling championships. We have hosted this event at Northern Illinois University since 1999. The IESA board of directors voted to put this event out for competitive bids this year. It will be awarded April 6. We are in competition with Bloomington/Normal, which is where the IESA offices are located. We submitted a very competitive bid. The organization that is awarded this bid will host the event from 2019 to 2023. The number of wrestlers who will be able to compete in the championships has been increased from 456 to 608, dramatically increasing the economic impact for the host community. *Story courtesy of the Daily Chronicle.